The St. Laurent's turned Addams Family! This is my husband, my kids and I! My kids had been re-creating Addams Family scenes one day (probably not appropriate for an 8 and 5 year old) and we were talking how much we love the movie. I was then in my sons closet and noticed the gray & black striped shirt and thought this looks like Pugsley Addams!! 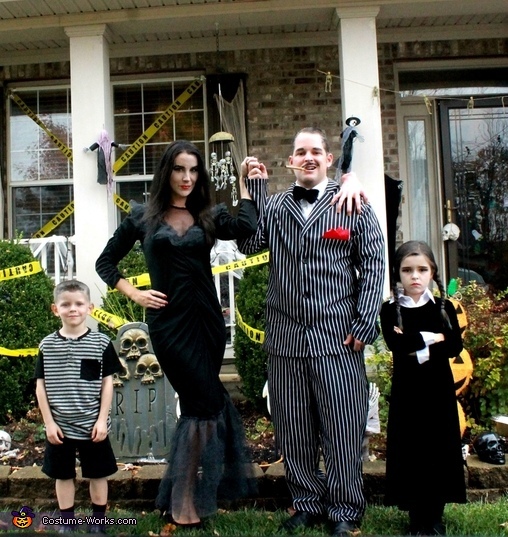 Oh my goodnes, we HAVE to be the Addams Family for Halloween this year!! The other costumes were all found at a local thrift shop, everyone's costumes in total cost $21 for everything!!! Perfect budget for our teacher and stay at home Mom salaries! !